A federal judge said Wednesday he will dismiss a complaint alleging San Francisco State University (SFSU) has a longstanding, systemic culture of anti-Semitism, but attorneys for the plaintiffs have promised to amend and refile. U.S. District Court Judge William H. Orrick said the scope of the lawsuit, brought by a group of SFSU students and members of the local Jewish community, was overly broad. Amanda Berman, co-counsel for the plaintiffs and director of legal affairs at the Lawfare Project, a non-profit pro-Israel legal think tank, said Orrick directed the team to "pare down complaint and deliver something simple and concise." Orrick said the complaint as it stands does not "allege specific intent to discriminate." The plaintiffs have alleged that SFSU has violated the U.S. Civil Rights Act and the First Amendment right to free speech, citing incidents that have taken place since the 1990s. The most recent episodes center on the exclusion of the Jewish Hillel center from an on-campus 2017 human rights fair, and an anti-Israel student club's shouting down of Jerusalem Mayor Nir Barkat during a 2016 speech. SFSU President Leslie Wong is charged with fostering an anti-Semitic culture by voicing support for the anti-Israel student club at a time when its leadership was allegedly threatening Jewish students online. 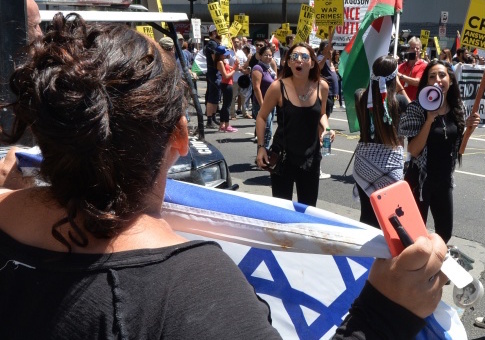 Professor Rabab Abdulhadi, of the SFSU College of Ethnic Studies, is targeted in the current complaint as key to the creation of the anti-Jewish environment. The suit, filed in June, demands admission of fault, punitive and monetary damages, and action be taken by the administration to protect its Jewish population. Berman said the team remained confident that it could bring a case proving specific, unambiguous instances of anti-Semitism. "Amending a complaint is a totally normal thing to do … facing a motion to dismiss very frequently occurs," said Berman. "This is not negative. This is not a loss." Berman noted that the SFSU case was mentioned earlier this week during congressional hearings on the Anti-Semitism Awareness Act, which seeks to establish a federal definition of anti-Semitism for the Department of Education to use in discrimination cases. David Spero, an active member of the Bay Area chapter of Jewish Voice for Peace—a far-left anti-Israel organization that honored a convicted Palestinian terrorist at its 2017 national conference—was at a rally outside of the courthouse yesterday with some 60 protesters calling for the case to be dismissed. Spero said Wednesday's decision demonstrated that the plaintiffs have no case. "This about the conflation of anti-Israel activism with anti-Semitism," said Spero. "In fact, campus anti-Semitism in California is not really a thing. People are throwing the term around, blaming Arabs and Palestinians, and no one is paying attention to the actual anti-Semites, the white supremacists and the neo-Nazis." Liz Jackson, spokesperson for Palestine Legal, an anti-Israel organization supporting Abdulhadi, declined to speak with the Washington Free Beacon. In a press release, Palestine Legal celebrated the dismissal of the "frivolous lawsuit," and quoted Abdulhadi's attorney as saying he looks forward to the plaintiffs re-submitting as "another chance to embarrass themselves." This entry was posted in Culture and tagged Anti-Semitism, California. Bookmark the permalink.